James Reason (of the Swiss Cheese Model8) once characterised the goal of error investigations as draining the swamp not swatting mosquitoes.8 Critical incidents arise from the interplay between active failures (eg, not double checking for allergies before administering a medication) and latent conditions9 (eg, workload for the nurse and reliance on human memory for a critical safeguard when electronic systems with built-in reminders exist). Returning to Reason’s analogy, we do not want to spend our time and expend our resources swatting at the mosquitoes of ‘not double checking’. Rather, we want to drain the swamp of the many latent conditions that make not double checking more likely to occur. 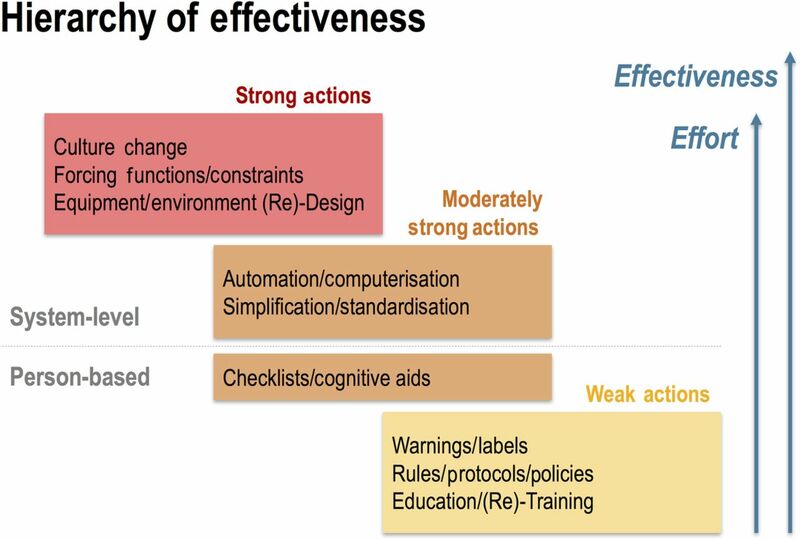 Too often, RCA teams focus on the first causal factor identified (eg, staff violation of the allergy-checking policy) rather than considering such factors holistically as parts of a sociotechnical system (ie, interactions between people and technology embedded in an organisational structure). Kellogg et al7 report policy reinforcement among the most prevalent corrective actions stemming from RCAs. For example, after investigating a case in which a surgical sponge was left inside the patient, the RCA team concluded that the organisation’s policy for counting equipment was effective and that human error was to blame. The ‘corrective action’ thus consisted of simply reiterating the current policy. This represents a common pitfall of RCAs: investigators complete their analysis after identifying a human error (eg, breached policy) rather than digging deeper into system problems.5 ,6 Interventions necessitating substantial financial resources are rarely considered. Rather, investigators resort to corrective actions that involve person-based solutions (ie, imposing actions on the individuals), focused on what is possible as opposed to what is needed.13 ,16 Successful identification of corrective actions often depends on acknowledging that clinicians rarely intentionally violate policies. Lack of compliance usually reflects impractical policies in the context of poorly designed systems.13 ,17 The RCA team must conduct in-depth investigations (again, using broader methods than just staff interviews) to identify underlying cognitive, task, environmental, workflow, organisational or other system factors that contributed to policy noncompliance.
. Patient safety—the role of human factors and systems engineering. Stud Health Technol Inform2010;153:23–46.